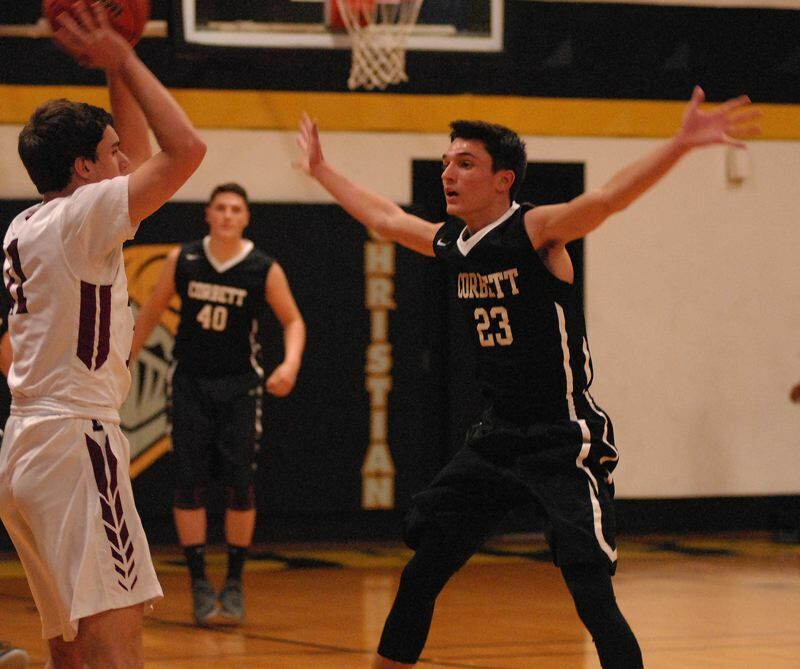 PORTLAND — Just when the Corbett boys basketball team had pulled close, Dayton put on a spurt and never looked back on its way to a 62-38 win to open the Westside Winter Jam tournament. After falling behind by five in the first quarter, the Cardinals made a focused effort to send the ball inside to 6-foot-4 center Mason Wright. He fumbled the first pass that came his way, but managed to collect the ball and make an aggressive move to the basket that resulted in a trip to the free-throw line. He made the first of his two free throws. A blocked shot at the other end, put the Cardinals on the move again with Dylan Paintner dribbling into the lane before sending the ball toward the sideline. The pass came in low for Corbett's Josh Newton, but he secured the ball at his knees and went into his shooting motion to hit a 3-pointer that brought Corbett within one midway through the second quarter. Dayton would net the next 12 points with Braeden Nowlin hitting a pair of corner 3s, while also driving to the elbow, absorbing some contact and hitting a shot from his hip. 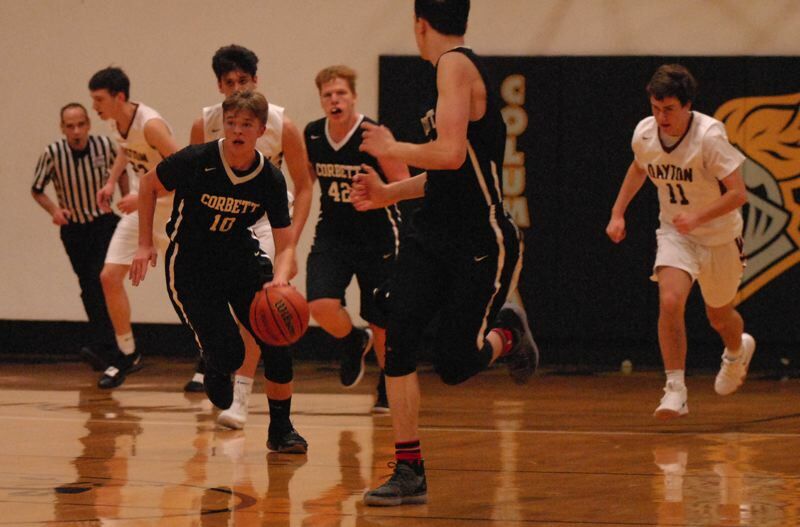 Corbett finally ended the run shortly before halftime when Nolan Han beat his defender off the dribble and whipped a pass through traffic to Preston Horvath for a layup. Horvath sank a 3 and drove to the basket for a layup early in the third quarter, but Dayton matched the buckets on the other end. The Pirates started to put the game out of reach when Nowlin sent an underhand lob off the backboard and teammate Jaysen Howard snatched it out of the air for an acrobatic layup. A few minutes later, Howard flashed to the front of the rim for a two-handed dunk, and Nowlin hit his fifth 3 of the game to put the Pirates in charge 40-21 midway through the third quarter. Corbett continues at the tournament through the weekend, taking on Horizon Christian at 5 p.m. tonight at Westside Christian. The Cardinals host Columbia High out of Washington at 7 p.m. Tuesday. After a quiet start, Corbett got onto the scoreboard three minutes into the game when Paintner swiped a steal near midcourt and sent an underhand toss ahead for Newton, who rushed down the far sideline for the breakaway layup. Dayton dominated the boards early, getting second and third chances on most possessions, to build a 13-8 lead after one quarter. Dayton (62) — Braeden Nowlin 26, Jaysen Howard 12, Justin Morales 6, Dawson Ashley 5, Lukas Findley 4, Benji Hudson 3, Tyler Spink 3, Jacob Morales 3, Arce, Oliveira, Pantoja. Corbett (38) — Preston Horvath 9, Josh Newton 8, Nolan Han 5, Dylan Paintner 4, Isaac Dennerline 2, Nathan Ronfeld 2, Jake Newton 2, Spencer Zeise 2, Mason Wright 1, Rolens, Vasen, Fundak.